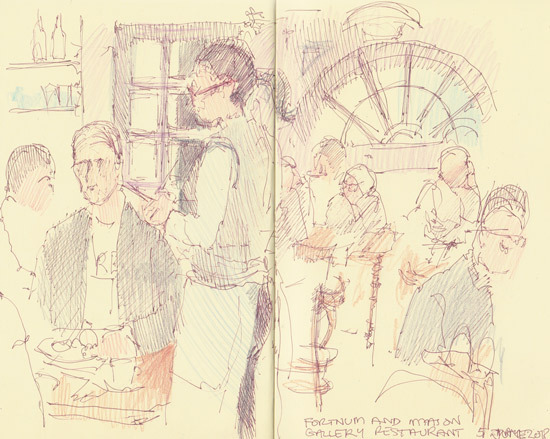 I sorted out my notes from the press preview and started my sketches of my Table d'Hote lunch. 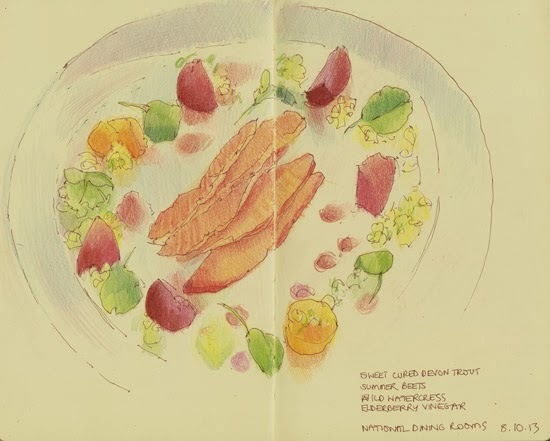 See National Dining Rooms menu [External website]. It came with a very nice glass of red wine. Each is sketched fast in en and ink, then I colour fast using coloured pencils and finally I do a bit of finishing off at home - but it's not a lot. The bulk is sketched in situ. For some reason I can't get the colour quite right on the first course and the background page colour is off. Don't try to include all of the plate. There's no rule that says you can't crop plates out of the picture plane! 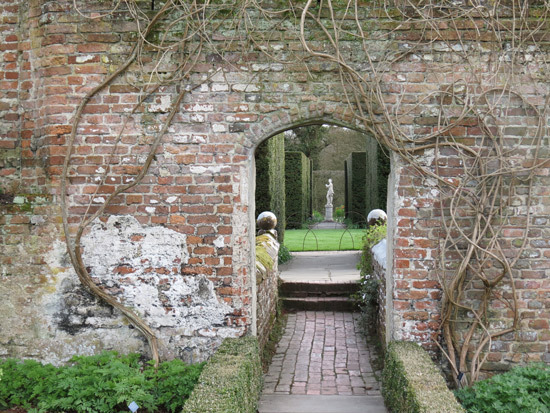 We paid a visit to Sissinghurst Castle Garden in Kent on a warm afternoon in late August. Everything was set off by the brilliant blue skies. I'm posting sketches in reverse order - because I like the one I finished last the best. 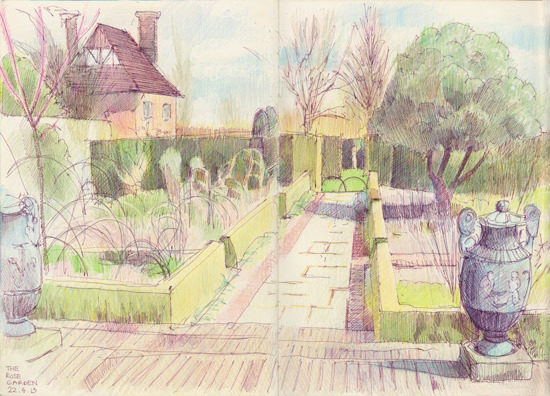 This is a coloured pencil sketch of the Rose Garden in the afternoon - with a contre jour aspect to the sunlight. The colour was touched in while I was there and then I completed this part of the sketch at home. 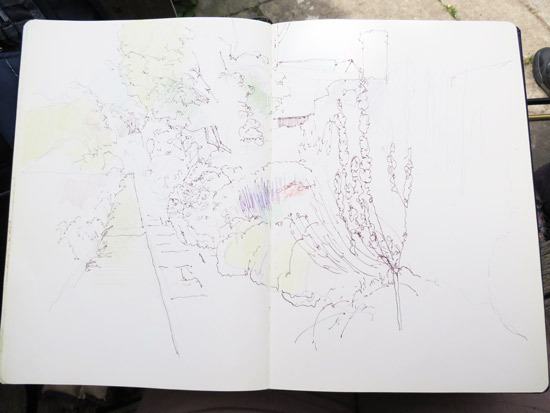 You can see the very fast pen and ink sketch done in the garden below the colour sketch. pen and sepia ink and coloured pencils in Moleskine Sketchbook, 8" x 10"
I was sketching very much "contre jour" so I was keen to get down the areas of darkest tone and the outlines of the shapes of the plants and flowers. 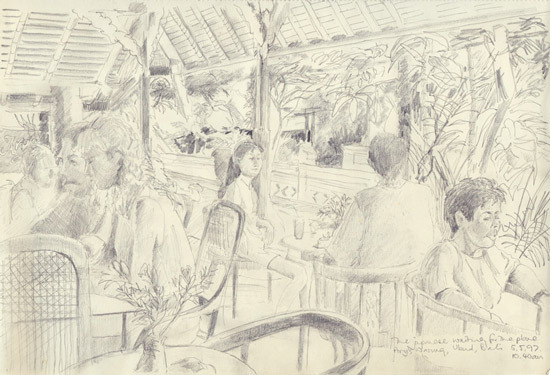 This is the sketch I did as we sat and ate our lunch before going into the garden. It's amazing how many overseas visitors this garden gets. I lost count of the languages I heard. Last Friday we went to Kew Gardens for the day - and spent the whole afternoon experiencing very warm weather and saying "It's going to rain soon" - but it didn't (until later that night)! Good weather for birds though! We have a favourite spot next to the lake where there are some benches and you can see all the birdlife as well as the plants which grow on the water margins. 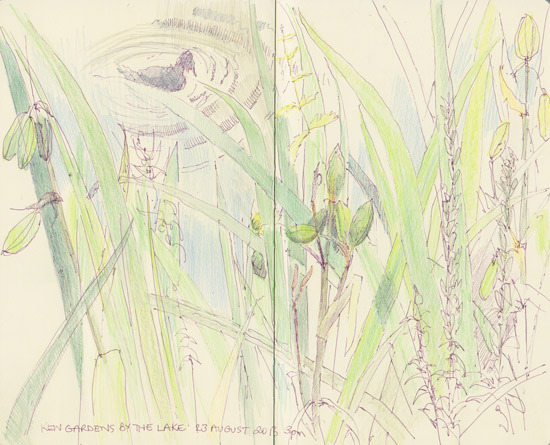 The coot wanted to be in the sketch! I've got an artwork planned and wanted some 'in situ' sketches of a plant - hence the above. 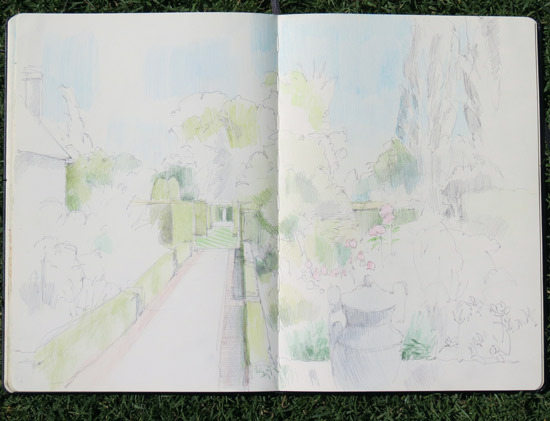 Last month I posted my Step by step sketch of the Rose Garden, Sissinghurst, but I completely forgot to post the finished version - completed at home. Until yesterday - when we started making plans for our next visit. 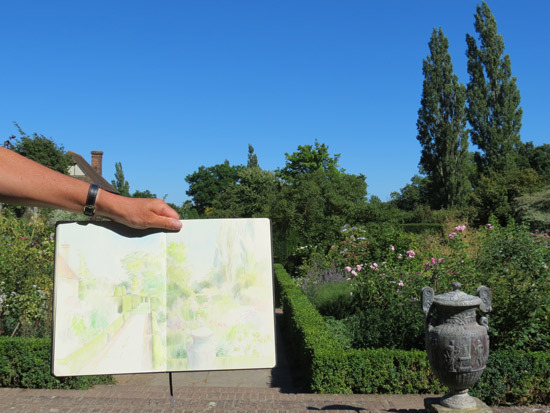 So here's the final version of Summer in the Rose Garden at Sissinghurst. 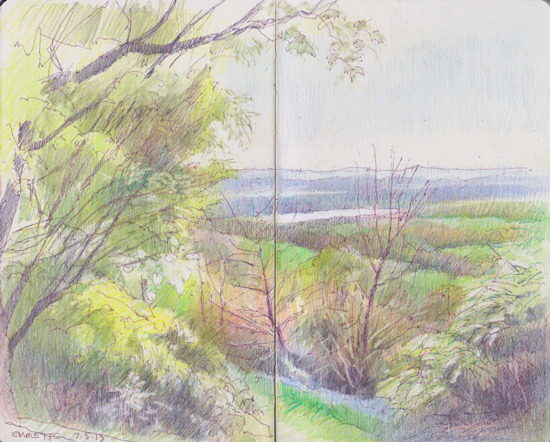 pen and ink and coloured pencils in Moleskine Sketchbook, 16" x 11"
A lot of what's done at home is about strengthening colours as opposed to identifying them. Sometimes I need to build up a few layers to get proper darks. My preference is for using complementary colours to get an optical dark green - and I find the colours red and orange come in very useful for toning down the blue of greens! I also find other tricky bits are getting the blooms to "come out" of all the foliage and finding differences in the greens so it doesn't look like one massive green splodge! 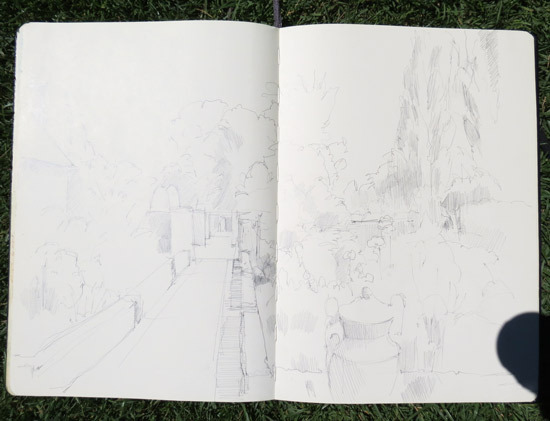 If you'd like to get inspired to sketch, draw or paint gardens check out my website Gardens in Art - Resources for Artists. 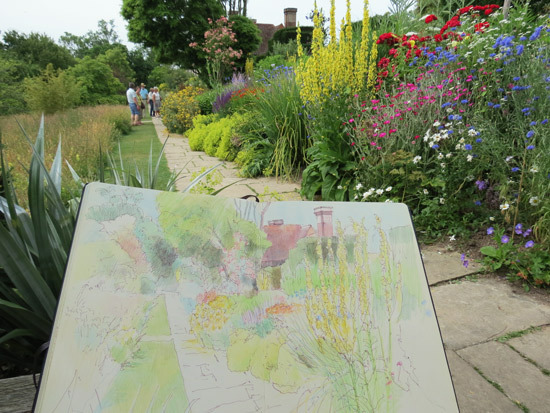 This is for artists who enjoy drawing or painting your own garden or gardens you visit. 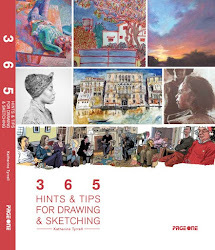 Its contents cover gardens in art and how to draw and paint gardens. The Portrait Restaurant is open for lunch and dinner (2 courses £25) - and breakfast and afternoon tea - and has a fabulous view across the top of the National Gallery to the London Eye, Whitehall, the Houses of Parliament and Big Ben! a visit to the the 245th Summer Exhibition at the Royal Academy of Arts which Liz had never been to before. It provided an interesting comparison to the shows she sees in Sydney, Australia. finished off by a walk back across the road to Fortnum & Mason and the real purpose of out get-together - a major chinwag and sketching session while having tea and cakes in the the Diamond Jubilee Tea Salon. We arrived at 4.15pm and left shortly before 9pm! 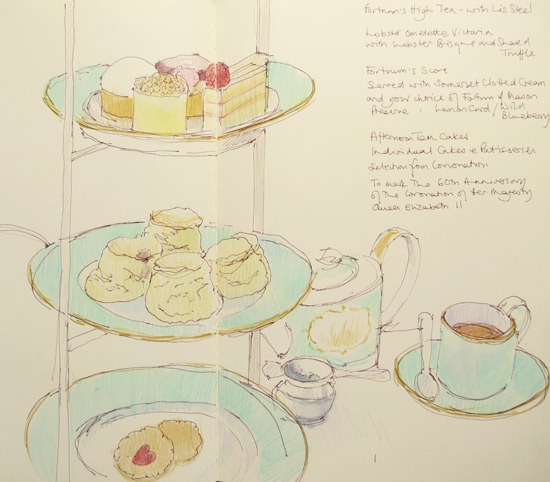 Above and below you'll see the sketches we made while enjoying our cup of tea and a few morsels! 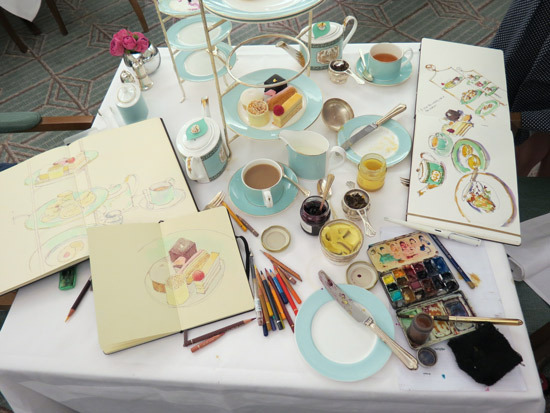 There are bigger versions of the photo on my Making A Mark Facebook Page and in Liz Steel is in London and sketching High Tea! on Making A Mark. 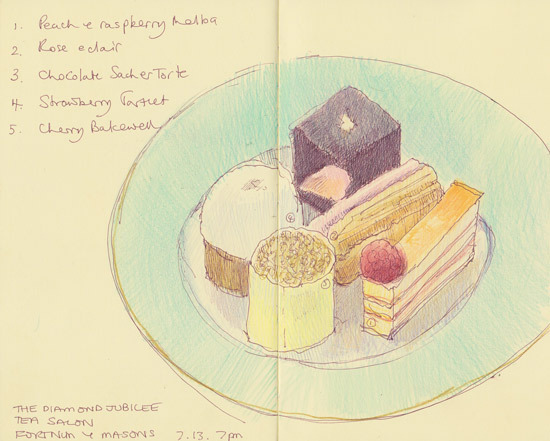 We started at Hatchards in Piccadilly where we found the Tea and Cake London book which had been recommended to Liz. It looked very interesting - but since they only had one copy I'm going to have to order a copy. I'm very partial to a spot of tea and cake in nice tearooms and cafes! The exhibition was busy and it was a joy for me to see again the tapestries A Vanity of Small Differences by Grayson Perry See 10 reasons to visit the RA Summer Exhibition 2013. I'm more impressed every time I see them. Etchings by Norman Ackroyd were also much admired! 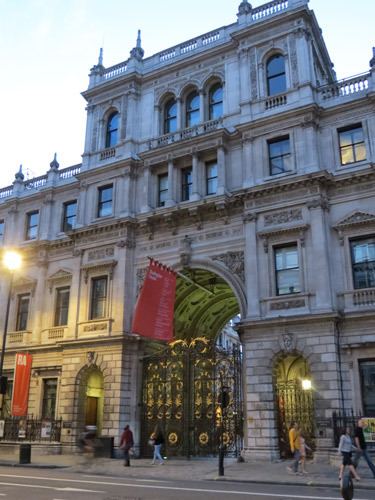 On the left is my photograph of the RA with its gates shut which I took as we left F&M. You don't often see those huge gates closed. We had a lovely High Tea and discussed all manner of things within our areas of experience and expertise. We are both inveterate "I'll just make a note of that at the back of my sketchbook" people! However back to the foodie aspect. 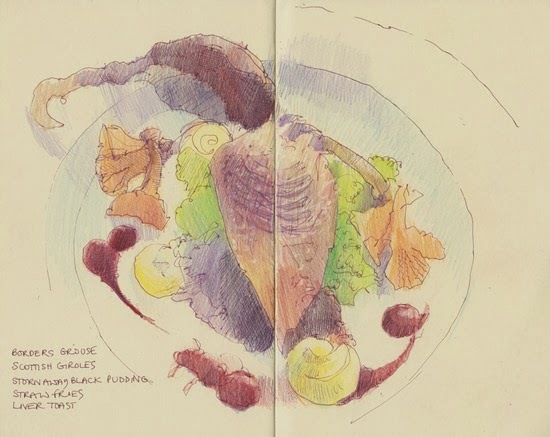 I had a the Lobster Omelette Victoria with Lobster Bisque and Shaved Truffle - which was divine - I got halfway through the omelette and then stopped and sketched it (see above). Liz had the Tempura Courgette Flower with Whipped Peroche Goat's Cheese and Truffle Honey. Then we got stuck into the cream tea - and more cups of tea! Two scones each, plus clotted cream and lime curd and wild bilberry jam! 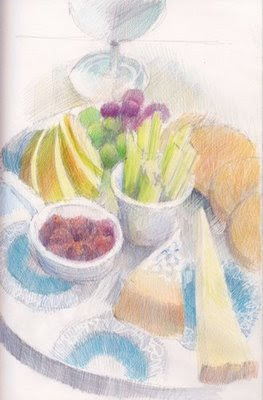 At 7.30pm we took a photo of the table, art media and sketches - and "the still life" which were still uneaten! 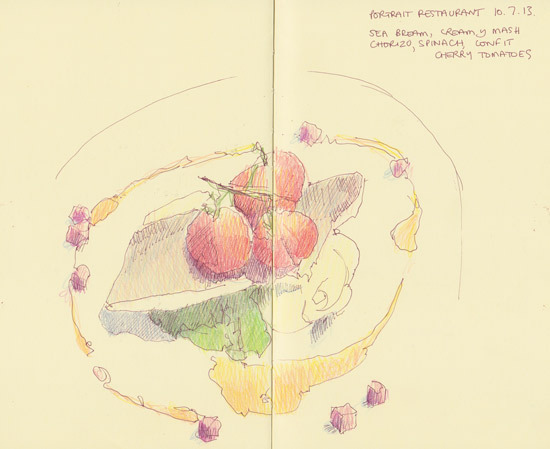 Such is the discipline of urban sketchers who put sketching before eating! I'd started three separate sketches while Liz worked her way across a big double spread. Finally, we decided the patisserie needed to be bagged for later and we finished with a slice of "proper cake" - in this case a Coconut and Lime Cake with Raspberries and a raspberry Mascarpone Cheese Cream. 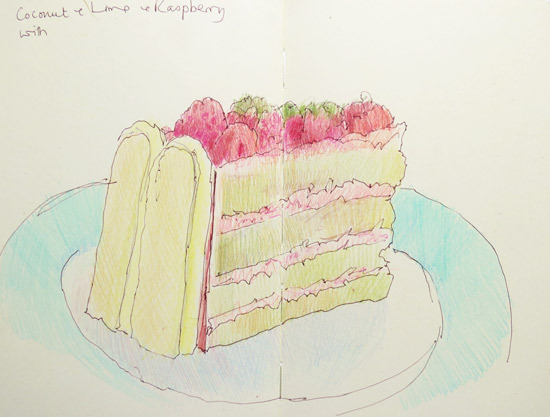 Coconut and Lime Cake with Raspberry Mascarpone Cream - it was pale lime colour! 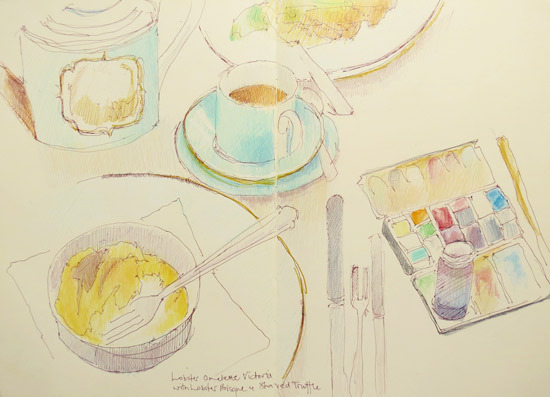 So all in all a good time was had by both of us and I look forward to Liz's next visit to London - and more tea and cakes and sketching! A visit to the Tea salon is not cheap - however the food is good, the staff and service are excellent and there's no rush to leave your table. Neither Liz nor I had any lunch beforehand and I didn't have dinner when I got home. So if you think of it a bit like a meal out at somewhere decent the cost starts to look much more reasonable. More details on their menu. 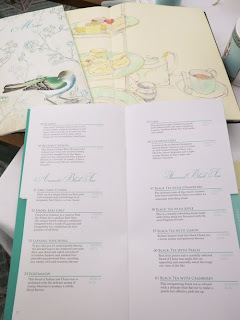 When I got home I whipped out my Luminance coloured pencil which is the same shade as the Fortnum & Mason colour for its china and strengthened the colour you can see in the photographs. 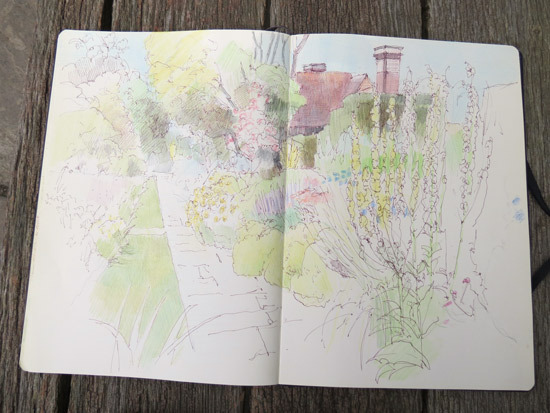 Here's a photo montage of my sketching the Rose Garden at Sissinghurst yesterday. We were there yesterday and this time I sketched the view I sketched in April - after a very cold spring - on a very hot day in July. Above you can the arm of "he who must not be bored while I sketch" who was asked to hold the sketchbook up against the subject matter while I took a photo. It's not finished but we'd agreed 4.00pm was tea time and this was as far as I'd got! I'll post the finished version when I've strengthened some of the colours. When I'm working on a large sketch I very often create small patches which are the 'finished' colour but wait until I get home to do all the layers which get large amounts of paper to the same level. I often leave off finishing the sky until I get home. I'll post the finished version tomorrow. 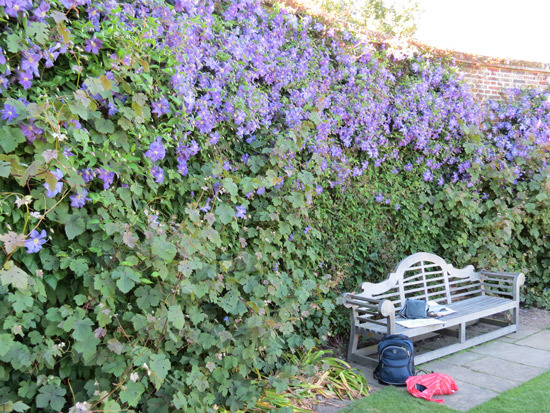 ...and this is where I was sat - under an absolutely glorious clematis called Clematis 'Perle d'Azur'. 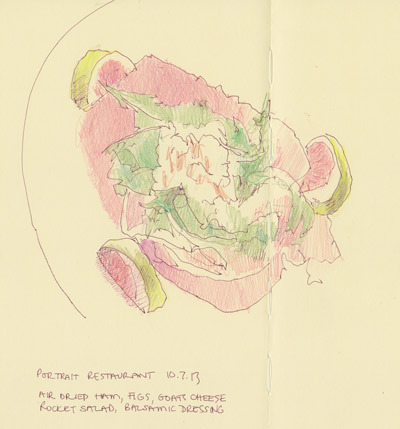 I lost count of the people who photographed it while I was sat doing my sketch. 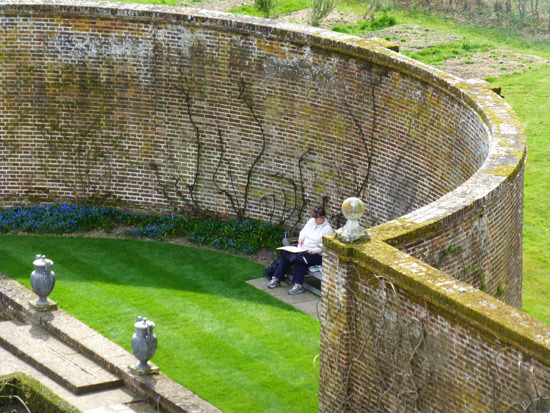 Below are more blog posts about sketching at Sissinghurst. The Rose Garden at Sissinghurst - late Spring 28 Apr 2013 Sketch of the Rose Garden and photos of Sissinghurst Castle Garden April 2013. 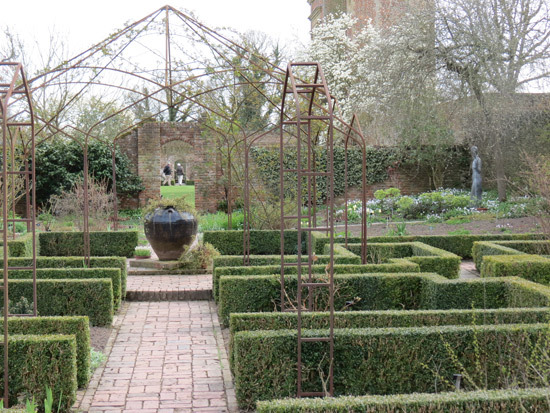 Sissinghurst - from 3rd hottest to 2nd coldest! 26 Apr 2013 Sketch and photos of Sissinghurst Castle Garden and Farm April 2013 plus discussion of weather and impact on plants. Vita Sackville West's Tower at Sissinghurst Castle Garden 01 Sep 2012 A sketch of the writing tower used by Vita Sackville West at Sissinghurst Castle Garden in Kent. Sissinghurst Moat and Orchard in Spring sunshine 1 Apr 2012 Sketch of the moat plus photos of the orchard on a sunny Spring day at Sissinghurst in March 2012. The Gazebo at Sissinghurst 17 Sep 2009 The Memorial Gazebo at Sissinghurst, built of Kentish weatherboard, was dedicated in 1969 to Sir Harold Nicolson (husband of Vita Sackville-West) by their sons, Ben and Nigel. 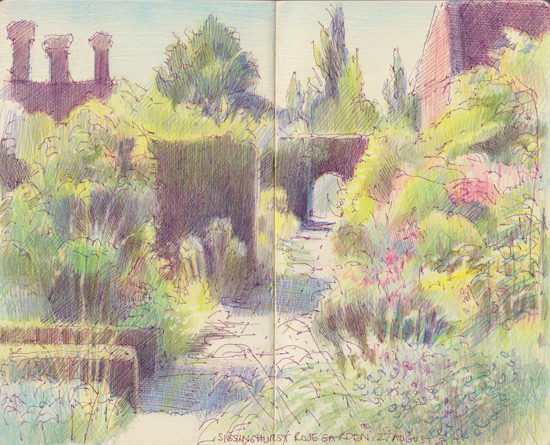 Sissinghurst - and tips for time limited sketches 08 Sep 2009 This particular sketch was done right at the end of a trip to Sissinghurst in August. 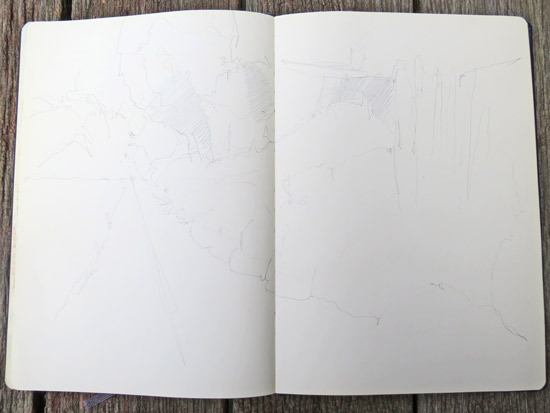 "He who must not be bored while I sketch" read his book sat in the chair outside the cottage while I sat on the doorstep. 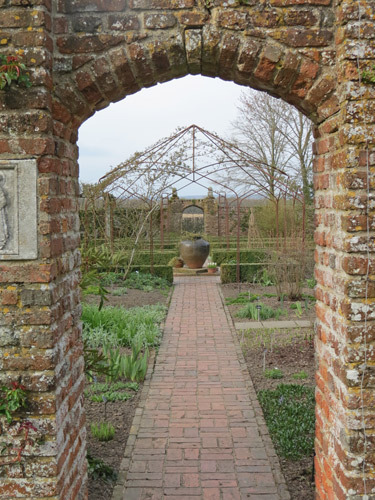 Sissinghurst and the BBC4 documentary 15 Mar 2009 This is a view I love every time I visit Sissinghurst - of the fields seen through the arches of the great Elizabethan Farm. 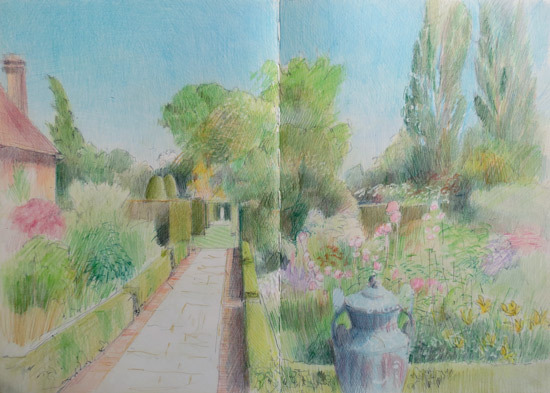 Spring at Sissinghurst 15 May 2008 Here's my latest sketch of the garden at Sissinghurst. Autumn at Sissinghurst 13 Sep 2007 Sissinghurst can be very limiting as to set-ups because they won't allow a lot of things (easels/tripods/chairs) into the gardens because of health and safety concerns as the gardens are so popular. More sketching at Sissinghurst and a salutary tale 07 Sep 2007 (of a sketch done in 2005) This sketch was a bit of a challenge in terms of placement and perspective, although, to be honest the only perspective I was interested in was whether the trees forms had recession - despite being different in type, shape and colour! 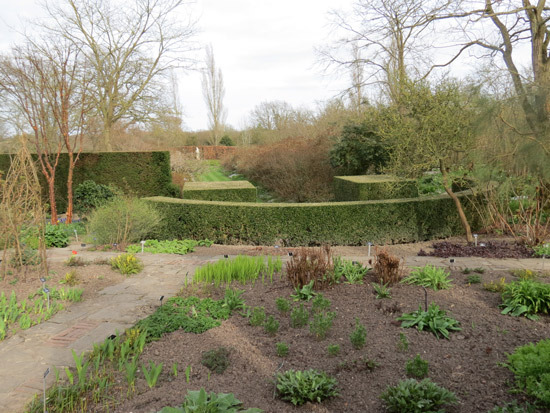 We visited the wonderful garden at Great Dixter yesterday. The garden was full of tourists from Europe who'd come specially to see the garden - which was looking very full of flowers and plants and absolutely splendid as usual. Below are step by step photos of how I got to the above (unfinished) sketch which I did while sat on the seat at the end of the Long Border. I thought people who've not seen one of my step by steps before might find it interesting. 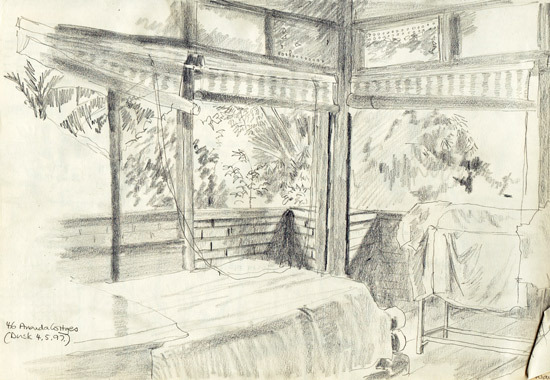 This was a complicated sketch, both in terms of subject matter, zones, and perspective. So, as I knew I was going to be drawing with pen and ink I decided to give myself a little bit of help. I first took a photo. That's something I very often do to work out what to make the four lines around the edge of the sketch - what to leave in and what to leave out. 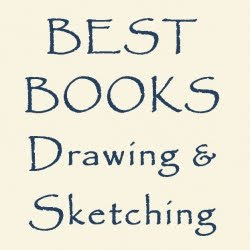 I looked at my photo and used it to map out some very rough guidelines quickly in pencil. This took me no more than two minutes. I was mentally looking for halves, quarters and thirds relative to the picture format as I found my guidelines. I added in a bit of shading afterwards just to remind myself where the darks are - it's help to locate places within the picture when doing a complicated sketch. This photo was taken after I started to draw in the lines I wanted for my sketch. 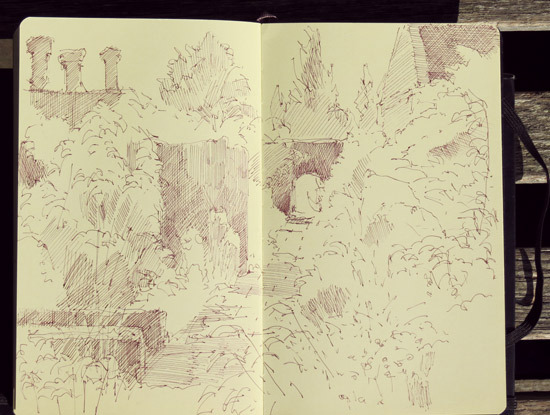 I highlight shapes - both large and small, squiggley edges of plants, edges of tonal areas, important lines and edges which guide in and around the sketch eg edge of the path, roofline. I also started to add in hints of the colours as I find this helps me with the drawing. Saves time trying to work out which bit is which! Initial layers of coloured pencil are focused on the things I need to resolve the distances involved. I find if I get the foreground, middle ground and background issues resolved I then find it easier to find my way around a complicated sketch. At this stage there are lots of "notes to me" in this sketch - of things that need to further developed and finished later. For example, I'm using ink to hatch in the beginnings of what will become darker areas. Plus I'm locating the colours of specific flowers in the border. 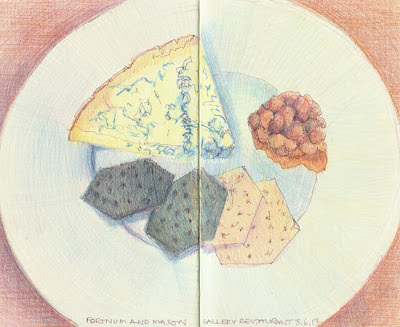 One of the main things I do when using coloured pencils is to mix colours and tones on the page. I don't want the 2D flatness that you get when you use just one colour for an area of colour. For example, there's about six colours in that roof and about four shades of green in the strip of grass alongside the path. The sketch as it stands at the moment (see top) is where I got before "he who must not be bored while I sketch" decided it was time for tea! It needs finishing. Everything is a little bit too light. The light areas need more darks so they'll start to pop. The main thing is that I needed more greens to complete the trees and the hedges. I'll post the proper sketch when I've finished it. UPDATE: Here's the movie of a slideshow of the sketches! 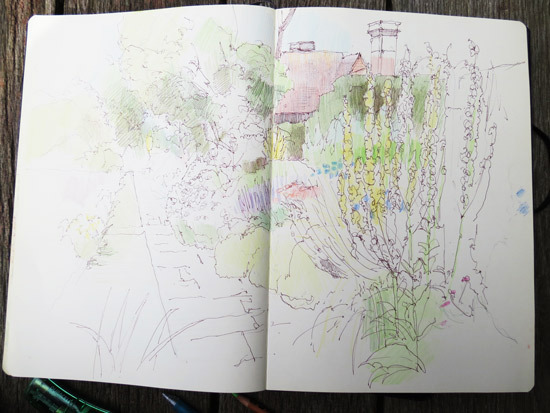 Below there are more sketches of Great Dixter - ordered chronologically. 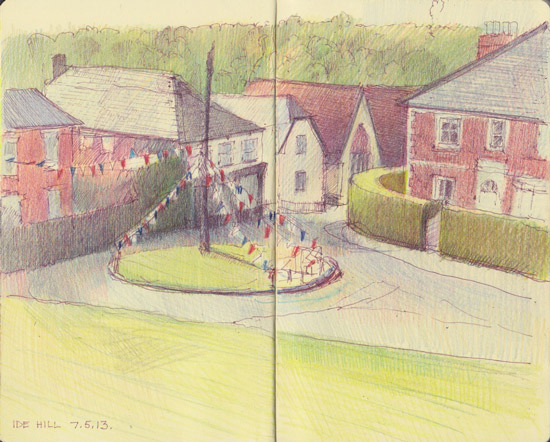 There's even another sketch of the Long Border! 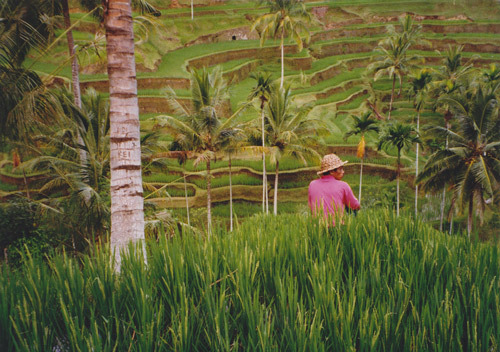 I had paddy fields right outside the window of where I stayed in Bali. 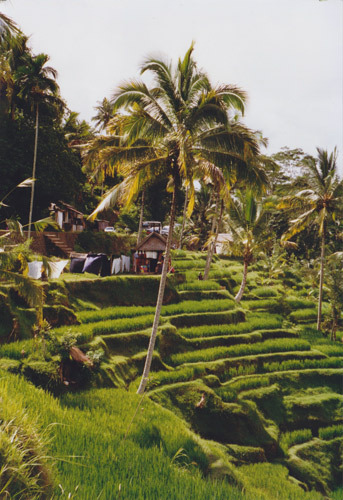 However we saw some some pretty spectacular views of paddy fields on the hillsides of Bali as we travelled around the island. One afternoon we stopped at a point where it's possible to draw the rice fields. 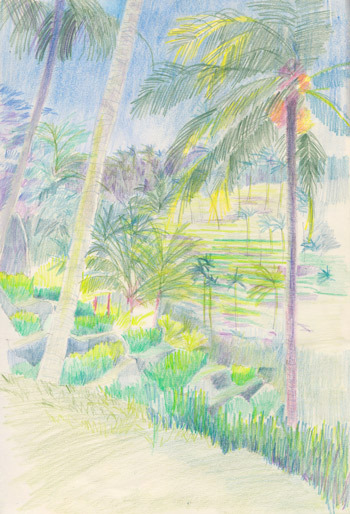 it took a long time to work out how to represent the palm trees and the paddy fields. 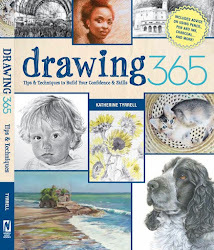 Never under estimate how much time you need to get your eye trained to draw new objects! it started to cloud over and then began to rain and pastel and rain do not mix! I really feel like I didn't do the view justice - but it was overwhelming! I still have the photographs I took while trying to work out the best angle for a drawing. 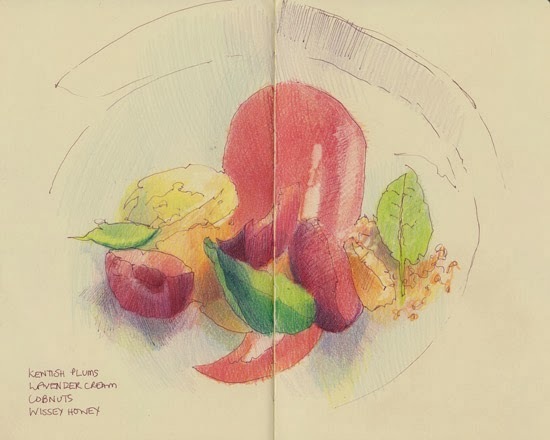 However it's very evident to me that even though photographs are generally unable to provide a reliable colour reference that my neocolors did not provide the colours I needed for this sketch. Everything is looking a bit too blue whereas the vegetation while lush leaned more towards apple / sap green end of the green spectrum - with some deep olives around the palm trees. Writing this post has made me want to have another go at capturing the scene and the colours. You can see below some of the photos I took. The view was spectacular. Paddy fields in front of me - on so many different levels! This next one shows the level on which i sat - I was perched on a narrow ledge just in front of one of the hawker's huts (which is hidden by the very prominent palm tree at the front of the photo). The spot where we stopped was obviously a regular tourist stop judging by the hawkers' stalls and sheds. One of the hawkers provided a very entertaining sideshow for our expedition. He was very adept at splitting coconuts for drinks and nibbles! Plus modelled three hats at once to show how stable they were on one's head! three hats on his head and ready to split a coconut at our command! 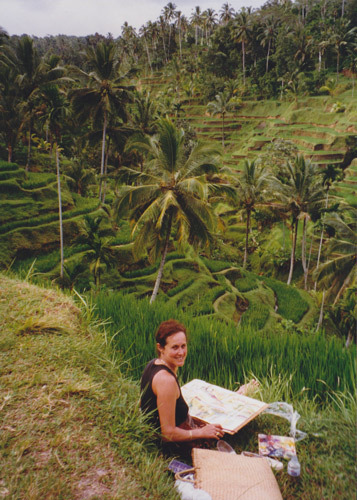 This last photo shows one of my fellow painters sat in front of the vista of paddy fields and palm trees. Not a place for easels! From here we went to Petalu - a small village north of Ubud - to see the white herons (kokocan) of Petalu coming home to roost in the trees along the road to the temple. 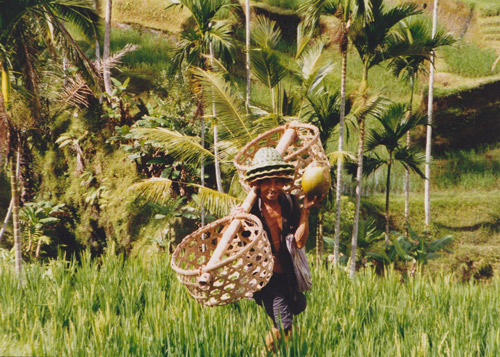 They arrive from all over Bali. This is a video of the White Herons of Petalu by a couple called Hans and Fifi which gives you a good sense of the sights and sounds of Bali villages but doesn't quite capture the moments just as dusk falls when wave after wave of white herons arrive and land in the huge trees lining the road to the temple. Magical! (This site has some good photos of a celebration associated with the herons and the village - and provide some commentary on what has happened at the village in the past). That's medical terminology for removing a cataract and implanting a new permanent lens. 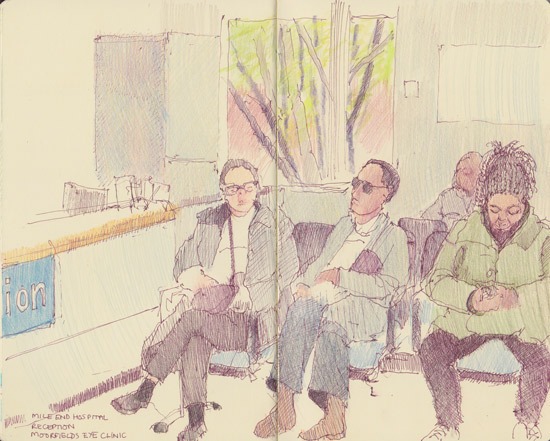 (see also Day surgery sketching at Moorfields Eye Hospital). I'm very pleased to say I'm infection free, inflammation free and the 19 eye drops a day have now been reduced to 12! Plus I can now read easily to the second to bottom line on the eye chart and today I drove again for the first time in weeks and weeks. Big mistake - I totally forgot about the dilating drops and had to get "he who must not be bored while I sketch" to come to where I'd parked the car and drive me and the car back home again! Subject to my check-up at the end of June, I should be able to get new glasses for reading and the computer and get back to normal activities At the moment I'm having to limit the use of my eyes for reading/computer use. Instead I'm watching rather a lot of television with my brand new better than normal eyesight for longer distances! Come July, everything will be back to normal - as in normal about 25 years ago! The above sketch was done while sat waiting to be called for my eye tests this morning. Drawn on site with colouring added when I got back home. My clinic is held at a local surgical centre on the Mile End Hospital site. It's just one of the 19 outreach sites Moorfields Eye Hospital has around London. These enable people living all over London to get treatment and monitoring and follow-up care without having to travel to the main hospital on City Road. I have to say this has been one of the very best experiences of NHS care I've ever had. I guess I shouldn't be surprised as it is a postgraduate teaching hospital! I certainly wasn't in the least bit surprised to see from the website that the hospital has just had an excellent report after a surprise inspection by the Care Quality Commission. If you live in London (or elsewhere in the UK if you have an uncommon eye condition) and need your eyes sorted out see if you can get your GP to refer you to Moorfields! Phacoemulsification of cataract with intraocular lens implantation #2 - which means super new sketching eyes! Plus I'll be able to get back to proper artwork having had severe difficulties seeing proper colour, tonal values and detail for the last 18 months or so. I was the last operation of the day so had some hours to while away - and there's nothing like a spot of sketching for passing the time and keeping you calm! I arrived at 11.30 and after initial check-ups for blood pressure and temperature and the insertion of my dilating drops I got stuck into my first sketch. The theatre gown in the foreground was for me later in the day. When you come back from theatre, those who have had a general anaesthetic get to rest up in bed. I was more than ready for my chicken sandwich and big pot of tea when I got back to my bed at 5.30pm having had nothing since 7am! 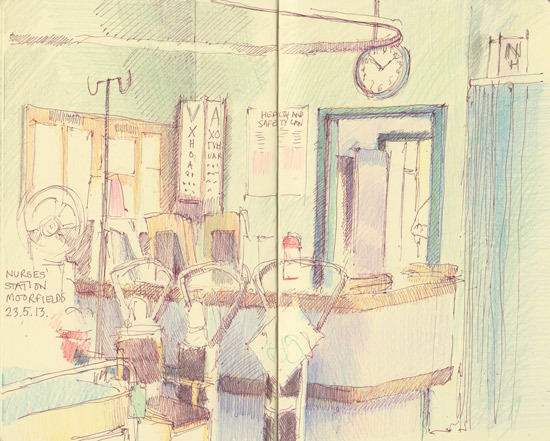 While I was waiting earlier in the afternoon, I drew the nurses station but didn't try drawing the nurses as they were always busy and came and went too quickly. I felt great after the operation and after post surgery examination and tests was back at the bus stop for the journey home two hours after I left the operating theatre! Thanks to everybody who helped me get my eyesight back! 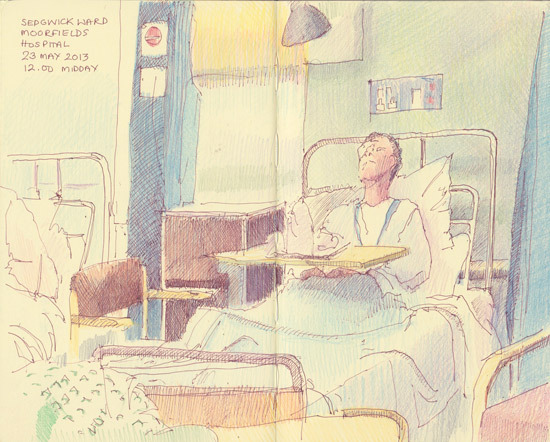 Postscript: The sketches were much admired by staff - as always seems to happen when I sketch while in hospital. However one of the interesting aspects of this particular operation is I might have earned myself a commission from one of the doctors. I now have an email to follow up on! 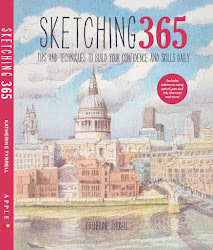 I've added in a module to the side column to say how you can commission a sketch from me. We visited the village of Ide Hill in Kent the day after the early May Day Bank Holiday. 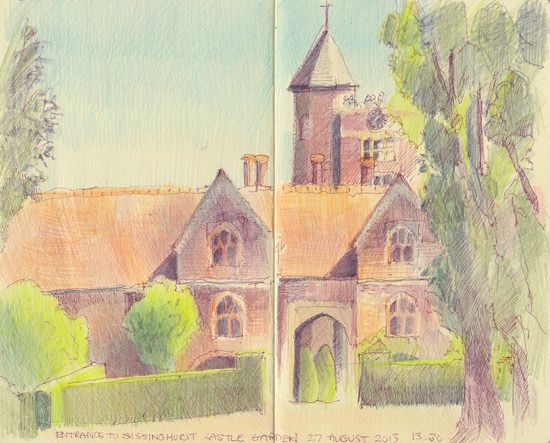 This sketch was done late afternoon while sat in the sun on a bench on the edge of the lovely village green. I assumed they hadn't got round to taking down the bunting for the May Day celebrations however it turns out The Ide Hill May Fair is on the second May Bank Holiday. This village is a little way from Emmetts Garden. It has the same name as the hill on which it stands. Apparently the name of Ide Hill was first recorded in 1250 as Edythehelle and is meant to denote 'Edith's hill' - which makes it an eponymic name ie derived from the name of a person. 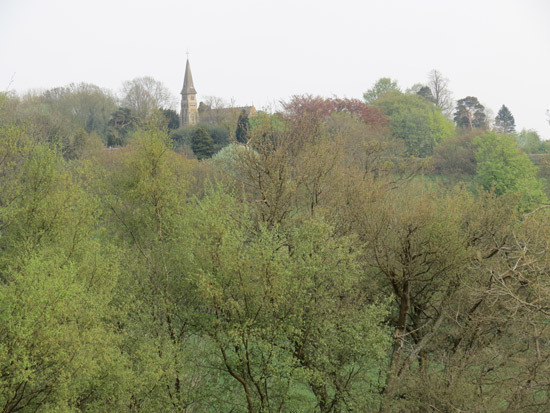 Ide Hill is 33.5 acres of semi-natural woodland that lies on the side of the Greensand Ridge. The area is designated a Site of Special Scientific Interest due to its abundant wildlife. People may remember the woodland which suffered very badly in the Great Storm of 1987 - that was on Ide Hill. It lost 70% of its trees. 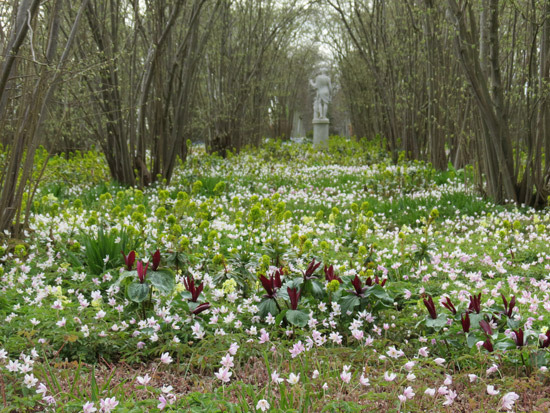 Emmetts Garden lost 95% of its trees and virtually everything we see today has grown since 1987. So basically - all those trees you see in the background have grown since 1987! 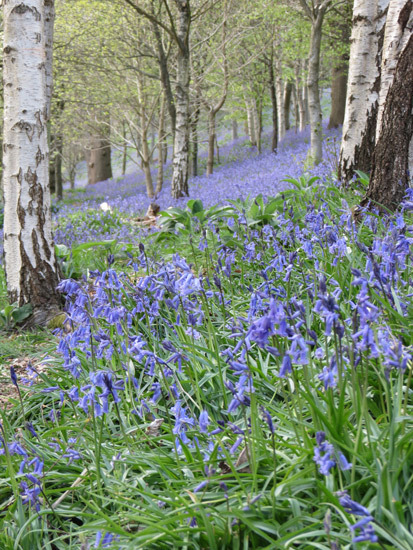 Every year, in Spring, we go to Emmetts Garden in Kent to see the bluebells in the woods. This is by far the best place I know to see bluebells. I've included a couple of photos at the end of this post. However the garden is located in one of the highest points in Kent - on top of a 600m sandstone ridge - which provides splendid views of the Weald of Kent if you know where to look and where to sit. I confess we re-engineered the seating arrangement for this sketch with a bench moved about three feet to the right! The water in the distance is (I think) bough Beech Reservoir - I've spent years wondering and finally got the map out and worked it out! 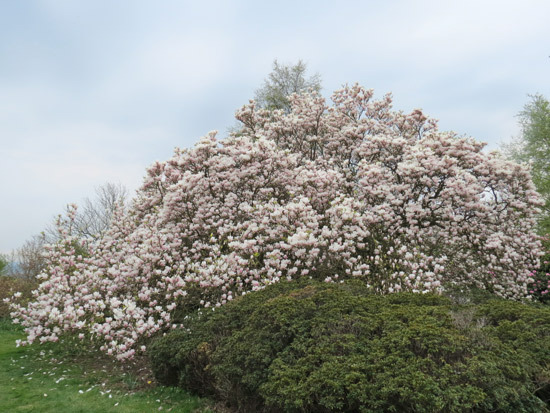 The garden is mainly an arboretum and has some splendid examples of magnolias which grow to an enormous size - very Himalayas! 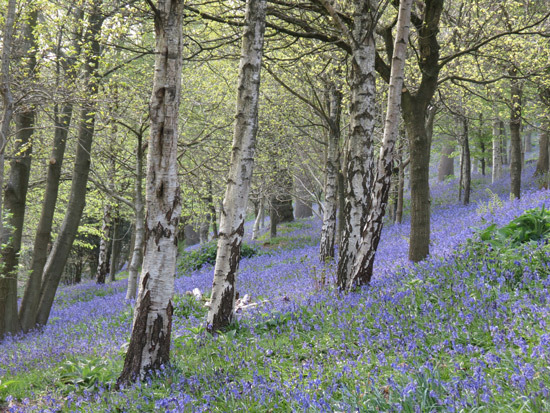 However it is famed for its Bluebells which carpet the woodland. 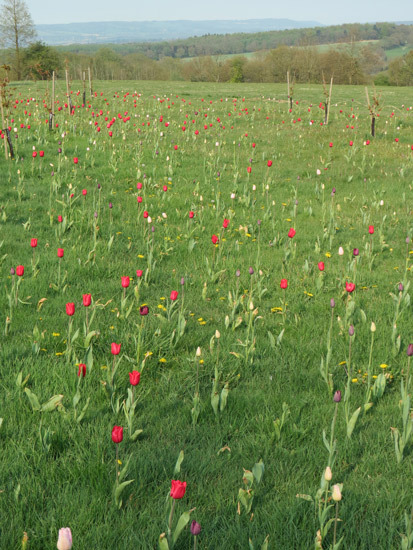 Near the Rose Garden, there is a new 'natural' planting of tulips and very young cherry trees which looked splendid against the fields in the background.